Here’s a test it consists of two questions: Question #1: How long would it take your firm to approve a $30,000 purchase of new monitors for your sales and marketing administrative staff? A day? A month? More than one month? And how much analysis would have to be done? Question #2: How long does it take to commit $30,000 worth of time, effort and out-of-pocket costs to write a proposal which everyone knows you can’t win! Obviously these are trick questions constructed to illustrate a point. But many organizations are too quick to commit to a proposal writing exercise which yields no contract nor any marketing advantage. To make the situation even worse, the total cost of creating the proposal is often unknown even after it’s finished. It’s very easy to invest $50,000 in creating a proposal. Salaries of a small team and a few airline tickets can quickly add up. On top of that, consider the opportunity costs. For example, two sales people may take two weeks to develop a proposal. If each of them sells about $20,000 a week, the company gives up $40,000 in sales with no guarantee that its proposal will win! The decision to bid or not is an important issue faced by every sales department. Where do you invest your money? Do you spend it on direct marketing activities, or on training, or on advertisements, or on proposal writing? What combination of spending gets you the most benefit? Indeed, the bid/no-bid decision is a topic addressed in every workshop and text dealing with proposal writing. Proposals are expensive and time-consuming. 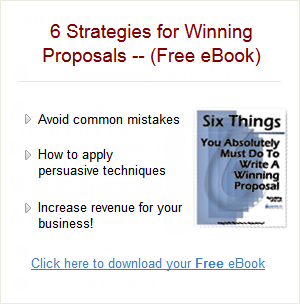 Sales people should analyze the rfp and other data, then decide if it makes business sense to develop a proposal. A standardized list of questions should be created and used to assist with the “bid/no-bid” decision. Each of the books adds a few details to this list. For example, Persuasive Business Proposals, by Tom Sant, identifies two decisions that must be made before starting on any proposal: Is this job worth bidding on? And, how much effort should I put into the proposal? The immediate and long-term value of the proposal. Potential profitability of the proposal. Long-term potential to establish a preferred-vendor relationship with this client. Potential to gain competitive advantage by winning the competition. Proposal Development, by Bud Porter-Roth, provides 15 key questions for your bid/no-bid checklist, including: Has the sales rep developed an account relationship or qualified the account? Indeed, this book says having the right technology and qualifying the customer are the most important criteria for bidding. Furthermore, it emphasizes that “a well written no-bid letter is often better than a hastily prepared proposal.” But the author also provides reasons why you might want to bid on a job you are unlikely to win. They include staying on the bidders list and establishing your credentials. Proposals: On Target, On Time, by Don Safford, expands the checklist concept by assigning a point value to 13 key questions for making the go/no-go decision. Organizations run through the questions and add up their score out of a possible 100 points. According to the author, question one “Had you heard about this project before the solicitation was released?” is the most critical. A “yes” answer to this question is worth 15 points, more than any of the other questions. A “no” answer is worth zero. Handbook for Writing Proposals, by Robert J. Hamper and L. Sue Baugh, also emphasizes the value of the bid/no-bid analysis. This assessment not only prevents firms from spending time and money pursuing jobs they can’t win, it also prevents them from winning jobs they can’t perform, according to the authors. In addition, the book recommends that you “no bid” jobs in a letter, which may help in marketing future work. What’s the bottom line? Simply this: Creating an insightful, well-written proposal demands the investment of significant resources. Therefore, the decision to commit those resources must be approached just as carefully as any other major investment of your organization’s time and money. Developing a well-reasoned rational for deciding which proposals to pursue helps your firm focus on winnable business and avoid costly misadventures.